For over 29 years, it has been transforming the transport and logistics concept, providing its customers with timely, reliable and cost-efficient solutions for even the most complex cargo projects for various industries, including aerospace, oil and gas, automotive, energy and others. Its fleet includes twelve ramp aircraft An-124-100 Ruslan and five modernised Il-76TD-90VD freighters and sales offices are located in different regions of the world. Volga-Dnepr provides transportation services on An-124-100, Il-76TD-90VD and Boeing 747 freighters to the world’s leading oil and gas companies. Since 1990, the oil and gas industry has presented one of Volga-Dnepr’s biggest customer sectors, generating over 10% of the Company’s business for the last 5 years. Typical projects include the prompt delivery of oversized equipment for upstream, midstream and downstream projects. Loading and offloading of non-demountable large-scale units is another of the company’s proven skills. The core components to make this happen are Volga-Dneprs’ personnel, the people behind the tools who have extended experience, knowledge and skills to deliver any project, no matter how complex it may seem. Today Volga-Dnepr’s global team provides the Oil & Gas industry with the technical and engineering air transport solutions the company is known for, including technical and project concept consulting services. The leading oil and gas companies entrust Volga-Dnepr with their sophisticated equipment, among them being Halliburton, Schlumberger, Exxon Mobil, TOTAL and others. The transportation of bulky and super-heavy equipment used to take months for ground or sea deliveries. Today, Volga-Dnepr professionals arrange the same deliveries within days. This significantly expedites production processes for customers, reducing costs and providing additional competitive advantages. Volga-Dnepr aircraft can land on unprepared runways and carry out cargo loading and unloading without the need for specialist airport handling equipment. This is of particular value for the delivery of equipment to remote regions where oil and gas fields are in the process of being explored. The optimal combination of aircraft performance, loading scheme and special technical solutions ensure that cost-efficient transportation of any cargo can now be achieved within the shortest time possible. The outstanding operating capability of the An-124-100 aircraft has revolutionised the logistics market. Companies in major sectors such as oil and gas, heavy construction, energy generation, aerospace and the automotive industry no longer needed to suffer the uncertainties of sending critical cargoes on long road and sea journeys that could take weeks. Using the An-124, they are able to achieve delivery times measured in hours, significantly improving their planning and productivity. Based on its total operating results, Volga-Dnepr Group is now ranked among the top ten air cargo carriers in the world, guaranteeing fast and seamless logistics solutions for your complex project shipments. Over 28 years of growth and development, Volga-Dnepr Group has attracted a highly-educated and highly-skilled workforce capable of tackling every aspect of the transportation and logistics process, however extreme and seemingly impossible the challenge may seem. From loading to delivery, this video shows a Volga-Dnepr AH-124-100 travel from Port Moresby to Komo in Papua New Guinea. For over 28 years, Volga-Dnepr Group’s unique aircraft fleet has been advancing the world of air logistics, enabling its global customers to achieve fast, secure and cost-efficient transportation solutions, even for their most complex logistics challenges. On average, Volga-Dnepr is now called into service by customers in the oil and gas industry more than once a week, and over the course of its 25-year history, we have operated more than 1,438 flights and carried more 94,000 tonnes of cargo for them. Volga-Dnepr Airlines has delivered 130t of industrial equipment in Russia, from Novy Urengoy to Sabetta, for one of the world's biggest gas recovery projects, Yamal LNG. Volga-Dnepr Airlines was quick to respond to a customer’s request to move a 30t shipment, including a 25t cable spool, from Maastricht in the Netherlands to Varna, Bulgaria, to urgently replace failed equipment on the Noble Globetrotter II drilling vessel developing an offshore gas field. 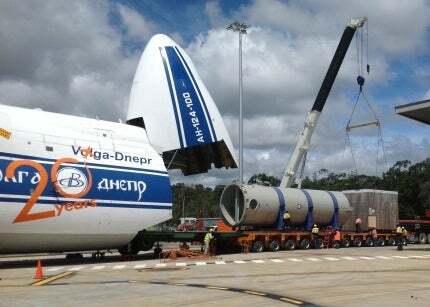 A special loading system developed for the transportation of long cargoes provided the perfect solution to help load a 35m telescopic crane bridge onboard a Volga-Dnepr Airlines’ An-124-100 freighter for its delivery to Rio de Janeiro. Volga-Dnepr Airlines first-ever 'season' of cargo flights to Antarctica transported more than 190t of cargo to support the new DROMLAN international Antarctic project supported by nations, including Belgium, Germany, Finland, India, Japan, the Netherlands, Norway, Russia, South Africa, Sweden and the UK. A large, 30t spherical ‘ball valve’ with atypical dimensions required the design and manufacture of a special frame by Volga-Dnepr to ensure its safe transportation from Milan, Italy, to Mumbai, India, via a refueling stop in Turkmenistan onboard IL-76TD-90VD aircraft. Volga-Dnepr Airlines’ quick response operations for the oil and gas industry were called into action to ensure the urgent repair of a compressor at Russia’s only natural gas liquefaction plant, Sakhalin-2. Volga-Dnepr Airlines has delivered an 11t oil and gas pump right to the door of a customer in the town of Farab, Turkmenistan. Volga-Dnepr Airlines has completed two simultaneous IL-76TD-90VD cargo flights to ensure the fastest possible delivery of urgent mobile drilling equipment for an oil and gas customer in Kuwait. Chapman Freeborn Airchartering and Volga-Dnepr Airlines have helped to keep a key oil facility open by delivering a time-critical outsize part from Switzerland to Brazil. A team of Volga-Dnepr Airlines' experts in Ulyanovsk, Russia, and London Stansted combined their expertise to expedite an urgent shipment of oil production equipment from Scotland to Turkey. Logistics provider G&O Solutions chose to partner with Volga-Dnepr Airlines when it needed to transport 50t of gas equipment for a compressor station from Kazan in Russia to Karshi, Uzbekistan. How significant are your charter freight operations for the oil and gas industry? Volga-Dnepr Group's Engineering & Logistics Center (ELC) recently developed a special loading frame to provide a timely and cost-efficient solution to move a 30t oil and gas shipment on-board an IL-76TD-90VD plane from Johor Bahru, Malaysia, to Yuzhno-Sakhalinsk, Russia. Two freighters from Volga-Dnepr Airlines' fleet, An-124-100 and IL-76TD-90VD, were called into action to deliver more than 80t of oil and gas equipment to Cape Town in South Africa. Volga-Dnepr Airlines has delivered a mobile 24m-high drilling rig on-board its AN-124-100 Ruslan freighter from Novy Urengoy to Mirny, Russia for Verkhnechonskoe oil-gas condensate field. Volga-Dnepr Airlines has enhanced its reputation for supplying end-to-end logistics services by managing the delivery of a 73t turbine 'runner' to Russia's Bratsk Hydroelectric Power Station, one of the world's leading producers of electrical energy. Oversize and super-heavy cargo transportation leader Volga-Dnepr Airlines recently delivered 45t of oil and gas equipment onboard a IL-76TD-90VD aircraft from Rio de Janeiro, Brazil, to Prestwick, UK. A 103t turbine rotor has arrived in Yekaterinburg, Russia from Frankfurt, Germany aboard an An-124-100 Ruslan heavy freighter aircraft operated by Volga-Dnepr Airlines.